Despite my absolute, unflinching boredom in response to Andrew Dominik’s latest cinematic effort, Killing Them Softly (2012), I have to give credit where credit is due: The Assassination of Jesse James by the Coward Robert Ford, a neo-western drama about the complex, unforgiving social dynamics of fame and infamy, is a modern day western classic. Witness the darkness of the west. Like the greatest westerns, The Assassination… stresses detailed character relationships and foreboding themes over empty visuals and contextless violence. This film doesn’t just have a well written protagonist (Jesse James, played with foreboding confidence and sarcastic menace by Brad Pitt) and a memorable antagonist (a timid, sympathetic Casey Affleck as Robert Ford) — every one of the picture’s major players is unique. Sam Rockwell, Jeremy Renner, and other members of the supporting cast contribute to the overall nuance of the narrative. No character is wasted, and all are treated with care. Then again, whether you see Brad Pitt or Casey Afleck as the protagonist or antagonist varies depending on whose point of view you prefer, the film’s diegesis or the audience. Within The Assassination’s universe, the hero is James, who is a superstar Robin Hood-figure, a man who is loved across the west and nationwide. Ford, from this perspective, is the villain, who kills the famous outlaw in cold blood, leaving his family widowed and fatherless. However, the audience experiences the narrative through Ford’s eyes, and he is the character with whom we sympathize. James is a complicated, enigmatic figure whose fame clouds his persona, yet his coldhearted aggression, cool wits, and condescending attitude pervade the outer layers of his charismatic-status. He would the perfect hero in a typical western, yet he is whom we grow to resent in Ford’s eyes. Ford is the opposite of James, an unsure, ordinary, and unimposing man with much to prove, like us. The complex, evolving relationship between these two complicated characters is the driving force behind The Assassination. It is both ominous and fascinating, both fantastical yet highly realistic. The evolution of Ford’s attitude from innocent, naive adoration of Pitt’s character to injured pride and embarrassment, and finally to jealous resentment and hate, is one of the best arcs of any character in any film from the past decade. Much has been made of the movie’s cinematography and beautiful visual style, engineered with craft and attention to detail by cinematographer Roger Deakins. The film’s washed-out colors of brown, grey, and black would seem dull and unimaginative in most other pictures, but Deakins utilizes the bizarre palette to create imagery that is distinct, surreal, and ominous. Aside from the creative use of color during daytime sequences, the inventive extreme low-key lighting during nighttime scenes makes for haunting, eerie filmmaking. Sequences that stand out in particular include a nighttime train robbery and a disturbing night-ride on horseback in which James guns down a would-be traitor in his midst. As much as I rolled my eyes at Killing Them Softly‘s endless cynicism, I give credit to Dominik where it is due. He and his team did a fantastic job with The Assassination… and made arguably the best western since Unforgiven (1992). It’s a fine assembly of veteran acting, terrific writing, and inventive cinematography that tells an unforgettable tale. 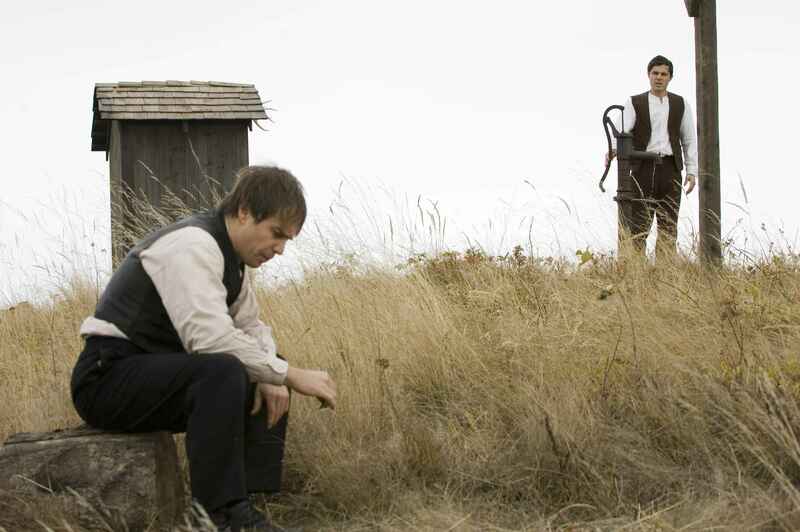 The Assassination of Jesse James by the Coward Robert Ford is a hauntingly beautiful and bleak examination of the allure of fame, as well as the complex dynamics and consequences of hero-worship. It will likely depress you by the end, but more importantly, it will mightily impress you. SUMMARY & RECOMMENDATION: Andrew Dominik’s superb script captures the essence of celebrity-worship as well as the darker side of fame with complex, memorable characters and an attention to narrative detail. Roger Deakins’ unconventional cinematography endows the movie with an almost surrealist shell that adds to the narrative’s unique visual style. The beautiful landscape shots and nighttime sequences are particularly stunning. Brad Pitt and Casey Affleck, along with an accomplished supporting cast, flesh out this bleak western world with great performances. 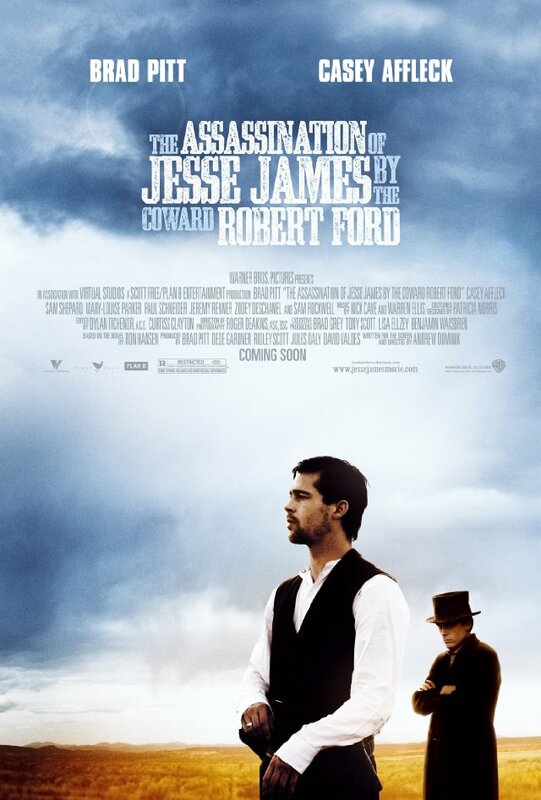 —> The Assassination of Jesse James by the Coward Robert Ford receives MY HIGHEST RECOMMENDATION.
? You wanna be like me, or you wanna be me?